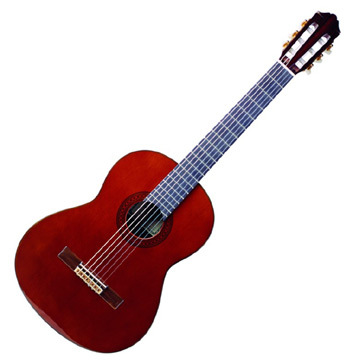 The Mohan Veena is a modified Hawaiian Guitar (known as Hindustani Slide Guitar) created and popularised by Grammy Award winning Pandit Vishwa Mohan Bhatt. It is used to play traditional Hindustani Ragas. The instrument is actually a modified Archtop guitar and consists of 20 strings – three to four melody strings, four to five drone strings are strung from the peghead, and twelve sympathetic strings strung to the tuners mounted on the side of the neck. A gourd (or the tumba) is screwed into the back of the neck for improved sound sustain and resonance. It is held in the lap like a slide guitar. The Mohan Veena is under tremendous tension; the total strings pull to be in excess of 500 pounds. 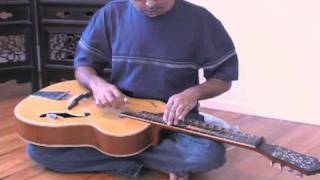 How to play Mohan Veena ? Some of the popular performers include Vishwa Mohan Bhatt, Salil Bhatt (who went on to invent the Satvik Veena, a derivative of his father’s Mohan Veena) and Canadian blues singer Harry Manx. There are many notable variants of the Mohan Veena in India most notably the Chaturangui Veena (created by Pandit Debashish Bhattacharya), Hansa Veena (created by Pandit Barun Kumar Pal), Shankar Veena (created by Dr.Kamala Shankar) and many others.